We will travel by motor boat to the port of Athinios, where a waiting coach will take us to the northern end of the island to visit the spellbinding town of Oia. 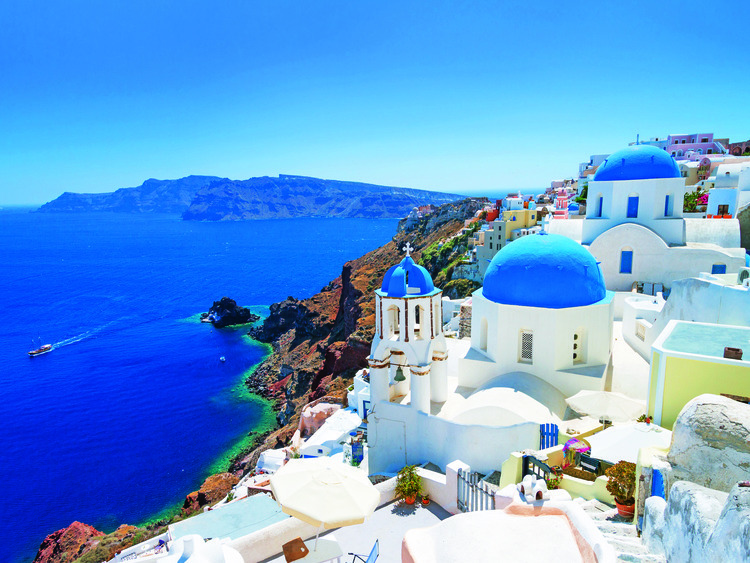 En route, admire the breath-taking landscapes of the caldera, the volcanic crater now submerged by the sea, surrounded by the high cliffs of Santorini. Our guide will show us the village's most interesting sights. We will venture into the wonderful marble-paved alleyways that wind up and down, lined with the typical ochre-coloured houses with blue domed roofs that characterise the island. The village surprises us with its peerless panoramic views of the neighbouring islands of Folegandros and Sikinos, as well as the now extinct volcano. After browsing the shops, where we're sure to find something original, we will set off again, this time for Fira. We will stroll through the island's capital, its narrow streets lined with typical white houses, and, after admiring the stunning panoramic views, we will take an unusual form of transport back to the port: a cable car!